Azure Naturals provides high quality facial skincare and anti-aging products using natural and organic ingredients whenever possible. We are committed to delivering the finest skin care system and making sure that our clients are 100% satisfied with the results. Our customers are looking for better health and better skin and the solutions that we develop will always be designed around these elements. We appreciate those who are taking the journey with us to return to your youth. 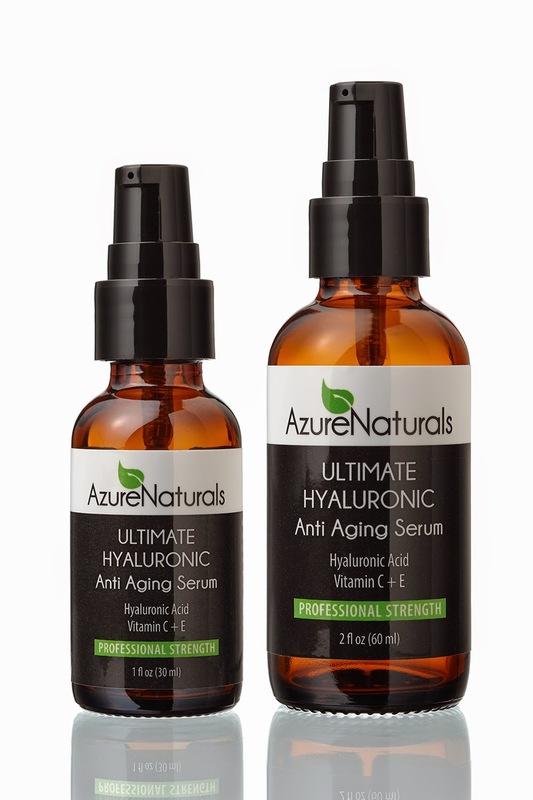 I have been using the Azure Naturals Ultimate Hyaluronic Acid Serum for a few weeks now and the biggest difference and the biggest improvement I have noticed is, my face feels a lot more moisturized and has a more radiant, youthful look to it. It's also so soft! I really liked that this serum has a little thicker consistency to it, but it still absorbed very well and quickly into my skin without leaving any kind of residue. I understand results may vary with each person, but I personally had a really great experience with the Azure Naturals Ultimate Hyaluronic Acid Serum and would recommend this product to anyone to give it a try. If you would like to try it out for yourself, you can purchase the Azure Naturals Hyaluronic Acid Serum right now from Amazon! Use Promo Code: AZUREBLG at get an additional 30% Off through June 30, 2014.